Juan applied his Crossroads grant to earn a CrossFit Level 1 Trainer certification. 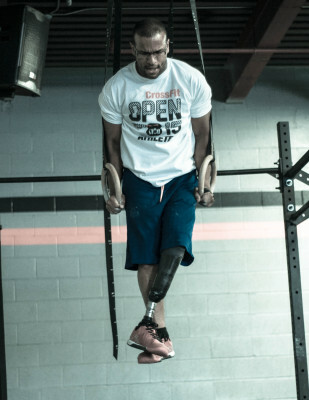 This is the first step for Juan, who is a leg amputee from below his left knee, to become a CrossFit coach. “I am proud to consider myself an adaptive athlete, and I look forward to helping others in any way I can,” he said. Juan hopes to find a CrossFit coaching opportunity and to work with Paralympic sports organizations to help athletes condition and prepare for competition. Determined to raise awareness of adaptive people worldwide, he leads by example, pushing himself to improve mentally and physically each day. And he plans to start writing a blog to share his mistakes, his improvements, and his experiences to motivate others. As an adaptive person, Juan understands the insecurities, the psychology, and the perspective of being adaptive, not only in sports but also in everyday life. “Now I understand it’s not about being an elite athlete, it’s about starting somewhere and working hard to improve.” When Juan saw a CrossFit workout for the first time in 2012, he wasn’t sure he could perform the intense exercise. Now he wants to coach it. Juan is from Panama and currently lives in Montreal, Canada.